Drivers at the nation’s largest port complex filed a lawsuit against XPO Logistics Cartage in Los Angeles County Superior Court on Monday, seeking to have port and rail truckers reclassified as employee drivers rather than as independent contractors. The truckers at the Ports of Los Angeles and Long Beach allege that XPO used tactics such as withholding jobs or triggering calculated dispatch delays that leave truckers waiting for hours at loading docks for work. 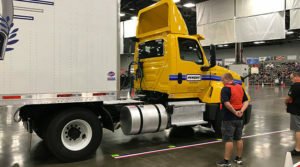 The lawsuit, which seeks class-action status, claimed the routing of loads to other drivers denied the truckers the ability to earn a living or pay expenses owed on trucks they leased through XPO. The drivers allege they weren’t provided accurate itemized wage statements, weren’t paid minimum wage and the company failed to pay them for missed meal and rest breaks under California law. XPO Logistics Cartage is a division of XPO Logistics. An XPO Logistics spokeswoman said the company has not yet reviewed the filing. The lawsuit, Alvarez vs. XPO Logistics Cartage, seeks more than $1 million for more than 160 port and rail drivers who have worked for XPO Cartage since April 2016. The complaint seeks restitution of unpaid wages and deductions made from truck drivers’ pay. As an independent contractor, Alvarez said he is responsible for paying for diesel fuel, repairs on the truck and other expenses that he would not be required to pay if he was reclassified as an employee driver. When it classifies drivers as independent contractors, XPO is violating labor laws to increase its profits, Gutman Dickinson said. The drivers allege that XPO siphons their earnings via unlawfully required paycheck deductions for drivers’ pay, operational expenses, administrative fees and cost of insurance. Drivers typically work five to six days a week, often 14 hours a day or more, Gutman Dickinson said. “It’s not uncommon for these hardworking drivers to take home less than $100 per week, sometimes even nothing, sometimes a negative paycheck,” she said. In May 2017, a federal judge upheld a 2015 decision issued by the Long Beach office of the California Division of Labor Standards Enforcement that ordered XPO Cartage, formerly Pacer Cartage, to pay five drivers nearly $1 million because of unlawful deductions and reimbursable expenses. The case is pending in the U.S. 9th Circuit Court of Appeals. The California labor commissioner ruled that XPO Cartage must pay four drayage truck drivers $855,000 for improperly classifying them as independent contractors when they should have been considered employees in April 2017. XPO is appealing the California ruling in that case. Drivers are also awaiting a decision from an administrative law judge in another case against XPO Cartage on whether the misclassification of drivers is a violation of the National Labor Relations Act, whether the company violated the NLRA by forbidding employees from discussing joining a union with co-workers and if the company threatened workers with retaliation for engaging in union activity. More than 30 percent of all container cargo in the U.S. goes through the Ports of Los Angeles and Long Beach. More than 180,000 jobs are tied to the port complex. Port carriers in California are responsible for an estimated $850 million per year in wage and hour violations, according to a 2014 National Employment Law Project report. Since 2011, California port truckers have filed 935 wage claims alleging misclassification with the California Division of Labor Standards Enforcement, which adjudicates wage claims and is the enforcement branch under the California labor commissioner’s office. Drivers have been awarded more than $46 million in about 400 of those cases, according to the California labor commissioner’s office. X.P.O. is in trouble in Ontario also many truck drivers complained to fed depart of labour. We need to clean up trucking before bringing in younger truck drivers and truck drivers from third world countries.